The crystal structures of inactive (GDP-bound) , active (GTP-bound) [3-5], and transition-state (GDP-AlF4-) [4, 6] Gat, Gai, and Gas, as well as structures for inactive het-erotrimeric complexes [7,8], have provided the framework for understanding the biochemical basis of G proteins as molecular switches. In addition, comparison of Ga structures delineates the molecular basis for heterotrimeric G-protein specificity. A discussion of the specific intramolecular contacts within heterotrimeric G proteins can be found in a detailed review  and in another chapter of this handbook. Figure 1 Schematic of the GTP-binding-protein regulatory cycle. Receptor (R) interacts with a specific agonist to induce a conformational change leading to activation (R*). R* is able to interact with the heterotrimer, Ga-GDPPy and catalyze the release of GDP from the Ga subunit. Upon the binding of GTP, GPy and R* are released from Ga-GTP. 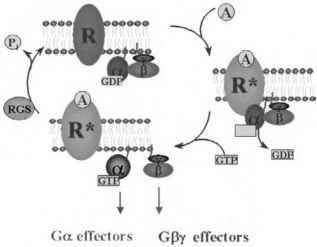 Ga-GTP and free GPy regulate the appropriate effectors. 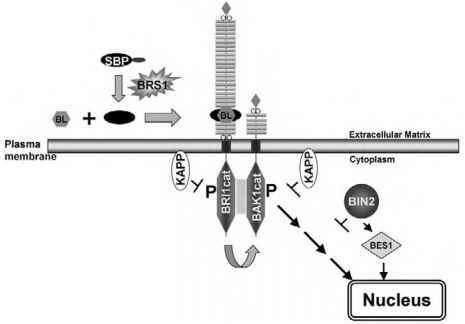 The intrinsic hydrolysis of GTP to GDP, with the assistance of GTPase-activating proteins (RGS proteins) returns the system to the resting, basal state. Figure 2 Hypothetical model showing the orientation of rhodopsin, the photoreceptor G protein Gt, and the membrane. The refined rhodopsin structure is from reference , and Gt is from reference . The individual ribbon drawings are based on the crystal structures and are shown to scale. The C-terminal residues after S316 are not shown, as there is no evidence that these residues interact with Gt, and they appear to occlude the Gt binding site. 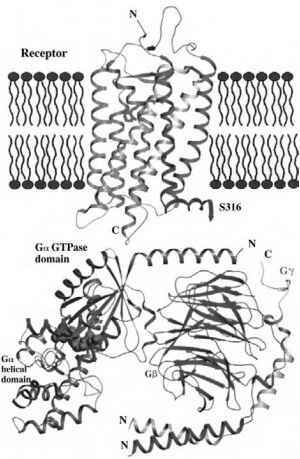 The orientation of Gt with respect to rhodopsin and the membrane is modeled on the basis of the charge and hydrophobicity of the surface, the known rhodopsin-binding sites on Gt, and the sites of lipidation of Ga and Gy . and nonreceptor protein kinases of the 5iMamily (Bruton's tyrosine kinase). The Ga12/13 subunits regulate the activity of low-molecular-weight G proteins of the Rho family, the Na+/H+-exchanger, phospholipase D (PLD) and the inducible isoform of NO synthase (iNOS). All Ga subunits are formed by two domains: a GTPase domain that is involved in binding and hydrolysis of GTP and a helical domain that buries the guanine nucleotide within the core of the protein (Fig. 2). The helical domain is the most divergent domain among Ga families and may have a role in directing specificity of interaction with partner proteins. In the GTPase domain, three nonconsecutive flexible regions undergo structural change between the GDP-and GTP-bound conformations [2,3]. These regions, designated Switch I, II and III, become more rigid and well ordered in the GTP-bound conformation. The structures of the extreme amino (N)- and carboxyl (C)-terminal domains are not solved in the isolated Ga crystals, as the N- and C-termini were either removed from the protein or disordered [2-4]. However, in two separate crystal structures of heterotrimeric complexes, the N-terminal helix is ordered by its interaction with GP [7,8]. Crystallographic studies of GPy heterodimer alone  and in the heterotrimeric complex [7,8] revealed that the GP subunit has a P-propeller structure containing 7 WD-40 repeats (Fig. 2). 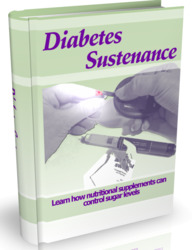 The Gy subunit interacts with the GP subunit through an N-terminal coiled-coil and makes extensive contacts along the base of the GP subunit. GP, but not Gy, contacts Ga in two regions, the N-terminal helix and a hydrophobic pocket present in Ga-GDP that includes the switch II region [7,8].